Zinc Oxide; represented with the formula ZnO is an inorganic compound, white in color and water-insoluble. Though naturally found, most ZnO used commercially is synthetic. Commonly used in treating skin irritations and in medical ointments but in present times, its usage has transcended to industries like rubber, cosmetics, glass & ceramics, agriculture, and other chemicals to mention a few. As mentioned above, ZnO is the most effective activator to speed up the rate of rubber vulcanization. Zinc Oxide is specifically effective in gelation (solidification by freezing) of the foam. Therefore, it gives enough stability in the gelation of foam when latex foam rubber product is manufactured. Zinc oxide has very high stability (resistance) in heat. 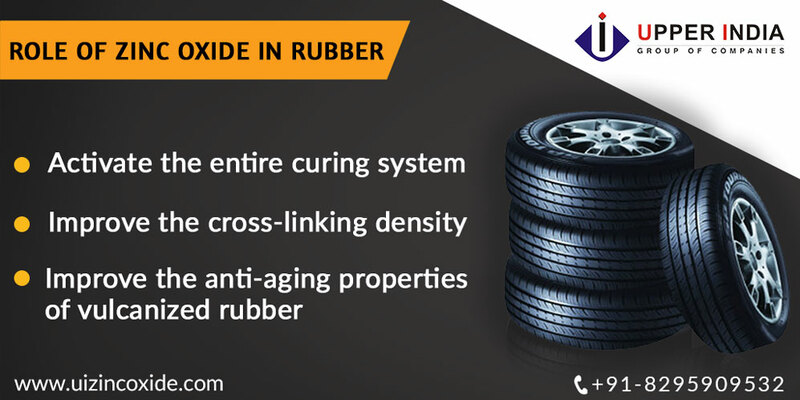 So, it is largely used for tire manufacturing so that the tires are safe even at high temperature due to high speed. Zinc Oxide is superb for its absorption of ultraviolet rays. So, when it is used with the rubber tyres, it gives them that extra stability against destructive UV rays of the sunlight. Zinc oxide is specially used with tinted rubber as it requires extra stability. Due to high brightness and proper particle size, ZnO is widely mixed with rubber products to make them look even more whitish. This use of ZnO as a pigment is made in various rubber made medical surgery equipment, rubber sheeting and side walls of the tyre. Rubber products represent the largest market for Zinc Oxide. ZnO is a widely used compound in rubber industry due to the excellent properties it shows as an activator for vulcanization of rubber. Vulcanization is a chemical process for converting natural rubber into a more durable material. Therefore, ZnO adds strength to rubber compounds and improves their resistance against heat/ abrasion and helps guard against ultraviolet degradation. The huge importance of Zinc Oxide to rubber industry is due to so many optical, physical and chemical properties it has. Tires, for example, require high loading of ZnO for durability and high heat conductivity. This is because heat building in tires at high speed is critical.Zinc Oxide is the key ingredient with 50-60% being used in rubber industry alone and with a marked presence in India and Global market as a leading manufacturer and exporter of a comprehensive range of Zinc Oxide products, Upper India has been successful in meeting the emerging market demands accurately. For further details, please click here.